Steve Beckow: I think, Lord, that if you’re all right with it, I’m all right. I’m prepared to welcome Archangel Raphael. Archangel Michael: Well, you know me, how I love to talk to all of you how I value our time together. And I thank you for building and maintaining this platform and this partnership. Let me explain. Seldom do we introduce each other, but I wish to tell you of the presence of my sacred brother, Raphael, healer of the universe and healer of humanity. We are working in tandem, always, and we have spoken today of matters that we’ve not brought forward before — the various levels of containment, the healing of the wounds of Atlantis (and yes, they are still being healed), of the what you call the vasanas that have arisen from those injuries and belief systems. And that is why my brother Raphael is here, for seldom does he really speak in this type of a forum. But he comes to begin the healing. And it is urgently needed, in your time and in your space, as you are accompanying Gaia, that planet that is such a combination of my brother and I, green and blue, into the new reality, into Terra Nova. So yes, I stay and I stand by his side as I stand by each of your sides to give you the strength and the courage, your sword and shield, and your staff of light, that you may heal. So, let me help. Farewell. 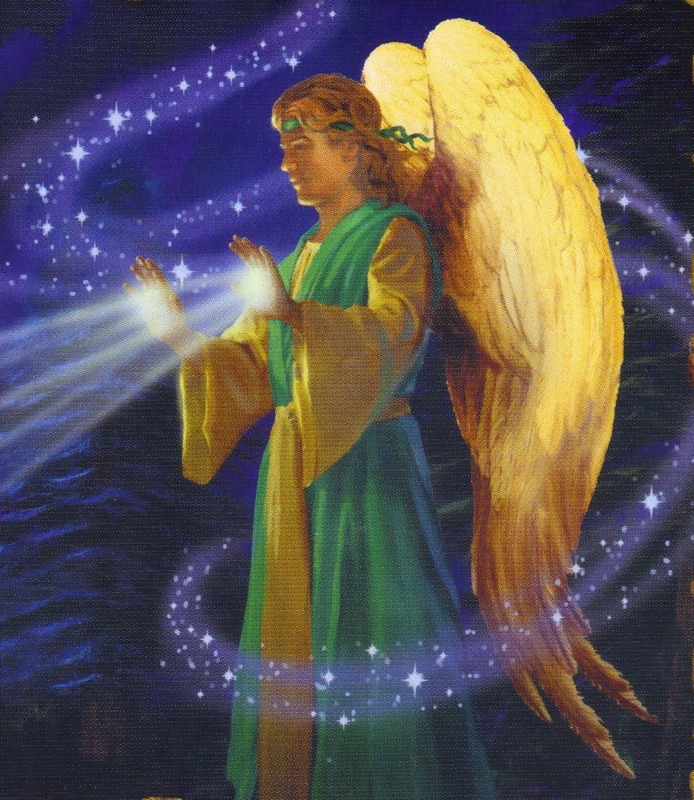 Archangel Raphael: I am Raphael. AAR: Welcome. Welcome, my beloved friends, humans and starseed, bright angels and Earth-keepers, hybrids galore. I welcome you. Yes, I am Archangel of healing, brother of the emerald ray, and I work with the multiverse and the universe, your universe, and of course also with the healing of humanity. And what does this mean in practical terms? It means, my beloved ones, that I work with each one of you. You may or may not be aware of me, for my presence is subtle, my elixir is sweet, my healing is gentle. It is joyful and it is loving. And we are in a time when we are bypassing so many of the healing methods that all of you know that are valuable, tried and true. No, they are not to be ignored, they are to be utilized. But, like the Mother/Father One, I am also working with each of your expanded hearts, and I am filling you with the love. For that is the healing of the universe, that is why the Mother and Father are amplifying. And the amplification began this weekend, yes, as I came to this small group that was simply the surrogate for the collective. (1) And I work with you that the wounds of war, the injuries of the human experience, past and present, are simply eliminated and healed. The only way this is done at the level and with the rapidity of what is required at this juncture is with such an influx of love that basically you simply surrender. And all over your planet — and I am not simply speaking of containment, or even the transition, because where I am different from a great deal of what else is happening is these are conscious surrenders. And that is what I wish you to do with me this night. Each of you who listens with me, who hears the sounds and more importantly the frequency of my vibration through Linda, I am asking to consciously, gently and joyfully, say yes to feeling. Your Ascension is not an unconscious or subconscious or etheric process. Yes, of course there is much that is transpiring in the healing of those levels as well. But you have already progressed, my angels, far enough that I am asking and inviting each of you to consciously accept the love, the joy, and yes, my brother’s peace, the Mother’s hope, and the Father’s wisdom. I am asking you to accept it all. This is your birthright. It is why you are here. It is why you have come — even those who think they have forgotten entirely. Yes, they have played magnificent parts in this drama, but now it is coming to an end. It is falling, not in a way of devastation, but in the way of opening to a new play, a new way of being. It is not a new act, it is not a second act, it is not the final act. It is an entirely new play. It is a new way of being. The only difference is you are not dying. I do not put a fancy name on this. I do not call it transition, passing over. It is surrendering and living and embracing the love that you are part of and allowing that love to fill you and to fill every person you encounter, to be the funnel for Ascension, to be the funnel for the Mother’s promise, for this time of fulfillment, of joining, not only with your brothers and sisters of Earth, but with your star brothers and sisters who have waited so long. And with all of us, with the ascended ones, to be able to have the freedom that was always your right, was always within your grasp, until you got caught in that quagmire called the old Earth. I am asking you, each of you, to consciously choose the healing that I offer you, that I bring you — yes, right through the very airwaves to your room, to your heart, to your home, to your neighborhood, to your planet. All you have need to do is to say yes. It is not a difficult choice, and yet, my beloved ones, some of you hesitate. That is all right. We do not hold this in judgment, we do not know judgment in your way. So, we gently embrace you, we nudge you, and we say, “Are you sure? And it is the fear that is the biggest obstacle. It is the fear that you will not be taken care of. It is the fear of leaving what you know behind. It is the fear of leaving your family, your l0ved ones, your community behind. It is fear that you will not have money, you will not have wisdom, you will not remember. It is fear that you will not be good enough, that you will not be worthy, that you will not be love. The list can go on, but that is the issue. It is the fear that you are not fully worthy, that somehow you will be skipped over, somehow you will not make it, and like Atlantis, you will perish yet again, or that you will be thought of as a fool — or even worse. There are far worse things than being thought of as the joker, my friends. It is far more serious, far more tragic, and as my sister Gabrielle would say, far sadder, more pathetic, to not progress because you are afraid of being thought of as foolish or wrong. Can you even conceive of abandoning or setting aside or limiting or putting on hold your deepest heart’s desire, what your essence came here to experience? What you have waited to create and co-create? Can you even conceive of saying no to that because you are afraid, because there is not adequate proof? My beloved ones, you are the proof, each and every one of you. The reason that I come, why Michael and Gabriel and Mother/Father come, why St. Germain continues to work with you, and Yeshua, is because you are so dearly loved, that you are so deeply cherished, honored and revered. You tend to think of that love and reverence as going one way. It is infinite, it is the infinity sign, it is circular, and it is shared. So, I come in the company of all, and with the permission and guidance of Mother/Father One. I ask of you to consciously accept the Ascension healing that is offered to you this and every night, and every day and every hour — for it is time. It is divine time, and it is your time. And you say to me, “Well, Raphael, how does this work?” And what it feels like is a heart opening as if the outer shell is crumbling away, as if someone has placed a key and unlocked your heart, and that you can breathe more deeply and feel the love and joy and the sense of wonder, not only of everything that is around you, and begin to see everything that is around you, not just the drama, but the shift which is so delicately underway. How it feels is you feel happier. It is a very simple litmus test. When you turn and you simply say yes, you open the floodgates. And if you think that you have been doing your work up to now, sweet angels, of course you have, but it has just begun. But it will not be arduous, it will be sweet and delightful. That is the offering that I have asked this wondrous program and channel and platform to bring forward this night. SB: Archangel Raphael? Could I ask a question, please? SB: The rising energies on the planet at the moment appear to be bringing up all our incompletions, all our unfinished business, which I call vasanas. And a lot of people are going through a tremendous amount of discomfort. Many people don’t understand how vasanas work, and so they project them outwards, as Jesus said, or they swallow them, they take them inside, suppress them. Can you help us, since there’s such a general experience of these unpleasant, unwanted conditions coming up, can you advise us on the best way to handle their rising so that we complete them, please? AAR: Yes. Because if there is anything that is not of love and not of completion within you, it is coming to the surface. And you are absolutely correct, it is causing all kinds of discomfort — mental, emotional, physical and even spiritual, for we are observing many with crisis of faith, with spiritual desolation, isolation. But also let us suggest that many people are acting out. And it is not comfortable, and it is certainly not pleasant to be involved in, either in the giver or receiver role. And that is why I am asking you to say yes to the healing. This does not need to take the form of playing out in drama. Now, we understand your human addiction to drama. It is thousands and thousands and thousands and thousands of years old. And maybe you think, and I use the word “think” or believe or feel that in order to clear your vasana that you need to walk through it and act it out and engage in the drama. And, my beloved ones, this is why I am here: I am telling you that is unnecessary. So, yes, let me tell you how you may do this. And you have been given a warehouse of tools. Your tool shed, your garage, your bedrooms, your studies are filled with tools. But I am here because we want rapidity and we want completion. We are here in our divine desire to assist and to eliminate. So, invoke me, call me. Place your hands on your heart, breathe emerald green and ask that it be done, gone, eliminated, consciously, not that “I am going to go and I am going to sit in a room for a month or a year or a day and process this.” Your process is as simple as turning to me and my legions and saying, “Please,” with the emerald ray. But let me say, if you call Michael, if you call the violet flame, we are all going to answer. But what we are eradicating, and what you have need to agree to, is getting rid of your belief system that you need to process it out. All you need to do is acknowledge it, say, “This is something I no longer wish, need, desire or choose to have.” You cannot all be sitting for the next year or six months in process. That time is over. So let it be done. AAR: What has changed is that you are shifting dimensions. AAR: It is not that you are not processing. And yes, sometimes the language gets confusing, so let me be clear. You are processing, and it is an instantaneous decision. So, process rather than taking what you have done in your human way as an elongated process. You may process instantaneously with our help. SB: And so it’s your help now that’s making the difference? Am I correct? AAR: … for 12 months, then go and do so, but you may in fact miss the train. AAR: No, we know that you have been diligent, and you are already at the train station and well seated in your coach. SB: Well, thank you, Lord. What would the most important action or thought that people could have to both induce the healing of the heart and to allow it to release its love out into the world? AAR: To consciously — not in angst, not in the feeling of, “I better do this,” or “I must do this,” “Oh, it is my service to do this,” but in your heart of joy to say, “I choose love. I choose love, I choose peace, I choose joy — now, as I go about my day.” What does that look like? What does love do? What are the choices that my heart makes that make me know that I am loved, that I am lovable, and that I am absolutely coming and being love? So, it is the conscious interjection. And when you feel yourself stray to the right or to the left, a little off base, then call me. I will gently upright you. I would be happy to do so. SB: Thank you, Lord. We have perhaps a minute left. Is there anything else that you’d like our listeners to know at this time? AAR: Yes. Part of your healing and part of you having this controversy about taking action or staying still — and yes, we refer to mass arrests — is part of your fear that if you do not take action, and appropriate action, in your discernment, that this healing of the Earth, this removal of what you have thought of as evil, will not take place. What I suggest to you and what I tell you, what I guide you: take action, my beloved ones, by all means, but take the actions of love. Let your heart guide you. You are the master, and you are trusted. Go in healing, my friend. SB: Thank you, Lord. Those were profound words.